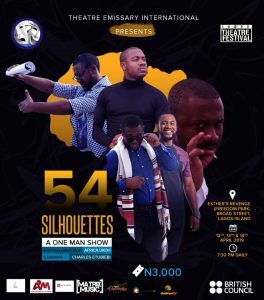 54 Silhouettes tells the story of struggling Nigerian actor, Victor Chimezie, who gets his chance at making it big time in Hollywood when his agent, Sonny Chuks, lands him a part in a blockbuster film. There’s a big shot producer backing the project and the lead actor is a mega star. It’s fame and fortune knocking, everything Victor and Sonny have bled for over the years. There’s only one problem. Victor discovers the movie is exactly what he swore he’d never do again: another “war in Africa” film. Caught between career ambitions and ideals of his African identity, Victor must decide whether to do the film or ditch it. DATE: 12TH , 13TH & 14TH APRIL, 2019.